To see why diatomaceous earth is a great filtration media and filter aid, you’d have to view it under a microscope. Diatoms have a wide variety of shapes and a honeycomb-like structure. The pores within and between the cell walls are so small, they trap bacteria, clay particles, some viruses, and other suspended solids from liquids, leaving liquids cleaner and with drastically reduced solids and contaminant levels. The packing of the small diatoms is irregular and creates a complex matrix with a very high porosity. This allows the filter media to both remove very small particles and extend the flow rate of the material being filtered. The high solids holding capacity of diatomaceous earth allows for much longer filter cycles (allowing more solids to be removed) than what would be possible with other filtration methods. Filtration is the separation of solids from liquids by forcing the liquid to flow through a porous filter medium and depositing the solids on the medium. A filter aid is a finely divided material which when added to the liquor to be filtered helps control flow and solids removal. The septum, usually screen or cloth, serves principally as a support for the cake. The filter aid is the filtering medium that traps the solids being removed and prevents them from blinding the septum. Filter aid filtration is mechanical, not chemical in nature. Irregularly shaped particles interlace and overlay in a fashion that leaves voids or open spaces. These voids form billions of microscopically fine interstices between the filter aid particles. The size of these openings is so minute that the unwanted solids are strained from the liquid. The vast number of openings compensates for their small size resulting in fast flowrates and brilliant clarity. What Makes a Good Filter Aid? Good filter aids are light in weight, chemically inert and form high porosity filter cakes to maintain a free flow of the liquid. The structure of the particles must be such that they will not pack too closely. This not only permits high initial liquid flow but also provides pore spaces to trap and contain the filterable solids and leave a high percentage of channels remaining open for flow. Particle size distribution must be tailored to permit precoating on coarse wire and yet give the desired flow rate and clarity. Diatomaceous earth, perlite, and cellulose are widely used materials that meet these criteria. Low density and rigid, irregular particles allow the material to form a porous matrix with up to 85 % void volume, as the particles interlace and overlay on each other. This matrix then functions as a superfine microsieve. Filter aid filtration is a mechanical sieving, not a chemical treatment. In some fluids, filter aids can be slightly adsorptive, but this effect is negligible. Generally, filter powders are not adsorbents like bleaching earth or powdered activated carbon. This filtering capabilities of diatoms’ crystalline structure make it an excellent choice for Fortune 500 companies and smaller businesses alike. Diatomaceous earth filtration use crosses many industries, from recreation to food and beverage, and pharmaceutical to automotive. 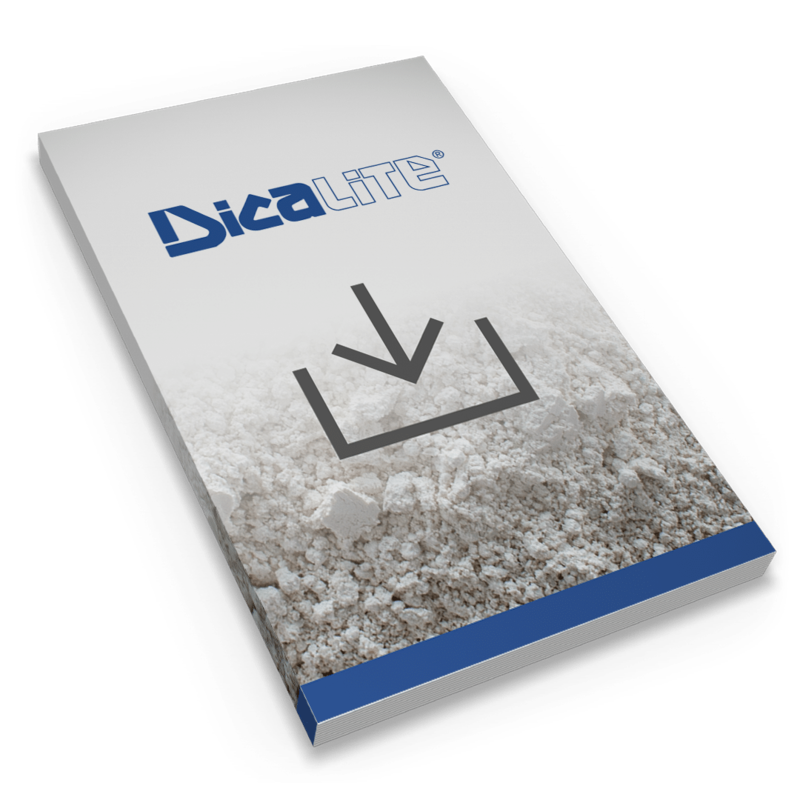 Diatomaceous earth filter aids are made available in a variety of grades to suit the solids removal requirement of any application. Diatomaceous earth makes the most efficient pool filtration systems because it can trap particles down to the micron-level and keep the water looking crystal-clear. It is used to filter many consumable items you may use on a daily basis, like oils, fruit juices, syrup, sugar, honey, wine, beer, and more. Most bottled beer and wine has been filtered at some stage with diatomaceous earth to remove solids and other contaminants. Diatomaceous earth is used for the filtration of antibiotics and other active enzymes, proteins, and contaminants in pharmaceuticals. It’s natural for ales, lagers, and other beers to produce a strong haze after the brewing process. Beers are filtered at some stage with diatomaceous earth to remove solids and other contaminants. Impurities need to be filtered down to the micron to prevent a hazy, unappealing look and taste. Diatomaceous earth removes these unwanted particles from beer without affecting the taste or color. Diatomaceous earth filters can be an integral part of the process that reclaims used lubricating oils. Natural Biodiesels are usually filtered with diatomaceous earth as part of the production and manufacturing process. Diatomaceous earth filters out particles—harmful or simply unsightly—that leave water foggy or dangerous. Dicalite diatomaceous earth is NSF Part 61 certified and can be used in the production of potable water by municipalities.